Three sets of military exercises kicked off in Europe on Monday, involving thousands of servicemen from a variety of NATO nations and their allies, amid a wave of similar action across the area. Estonia is holding its largest-ever military drills. Named Siil-2015 (Hedgehog), the maneuvers involve about 13,000 personnel. The number includes about 7,000 reservists, along with members of the volunteer Estonian Defense League. Siil-2015, scheduled to last until May 15, also involves forces from the US, the UK, Germany, Latvia, Lithuania, Belgium, Poland and the Netherlands. American troops, who are staying in Estonia as part of the massive training operation Atlantic Resolve, will bring four Abrams main battle tanks to the exercise. British, Belgian and German air defense units, as well as several NATO warplanes, will also take part. The Lithuanian Army is holding its own maneuvers as part of the largest national drills called Zaibo Kirtis (Lightning Strike). The training involves over 3,000 troops. 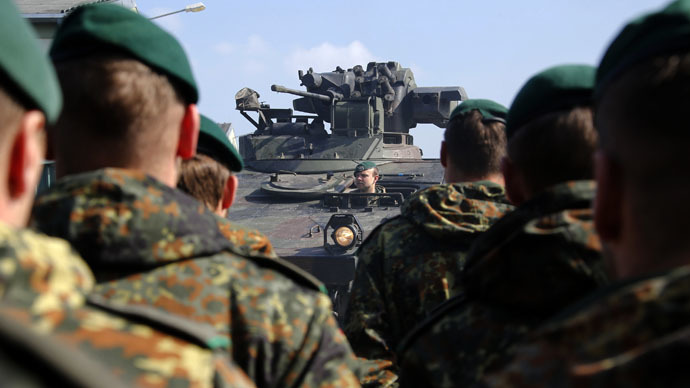 It is focused on joint action by the army and civilian authorities against so-called hybrid threats combining both military and non-military methods of fighting, according to Army Commander Major-General Jonas Vytautas Zukas. In a statement cited by TASS, the major-general said: "The exercises will simulate situations when the Interior Ministry’s forces and resources are insufficient to neutralize various extreme situations unrelated to the direct repulsion of an imaginary enemy’s attack and the army should be involved." Lightning Strike will also be testing the country's mobilization system and cyber security works, according to the Defense Ministry's press release. In Norway, NATO and its allies have gathered for annual anti-submarine exercises. About 5,000 servicemen from 10 NATO countries and Sweden are taking part. The drills, codenamed Dynamic Mongoose, involve simulated sub hunts utilizing surface vessels, aircraft and a variety of radar and sonar technologies. The US, Germany and Sweden are providing the submarines. The two-week exercise follows reports of a suspected foreign underwater vessel off the coast of Finland, which prompted the use of depth charges to scare it off. In autumn last year, a similar scare triggered a weeklong search in the sea near Stockholm, for what later turned out to be a civilian workboat. In the latter case, the finger of blame was unequivocally pointed at Russia, amid rising tensions over the Ukrainian conflict.